The cost of food is a major consideration for many. But with a few habit tweaks, you can spend less. Here’s how to save money on groceries. Grocery stores are literally designed to make us want to spend more, so it is not uncommon to get to the checkout counter and suddenly have a total that is much higher than you expected, planned or can even afford. Aside from the classic couponing, there are a couple choices you can make in order to save money at the grocery store. Here are some of our favorite tips on how to save money on groceries, with expert help from some of our favorite homesteaders and bloggers. First, determine how much you want to or can afford to spend on groceries per week. “We have a budget, and we try to stick to the budget,” said Nancy Wolff, homesteader and blogger at Nancy on the Home Front. According to the U.S. Department of Agriculture, Americans spend, on average, about 10 percent of their take-home income on food, so that is a good place to start. Ultimately, though, your exact budget for groceries will depend on you and your family’s needs. In order to stop yourself from buying things you do not need, plan the week’s menu before you go grocery shopping. This will also prevent you from purchasing more food than you can use before it goes bad, thereby reducing your food — and financial — waste. Some grocery stores will have curbside pickup, where you can order your groceries in advance online and pick them up at the store at your preferred time. Call your local grocery store or check online to see if there is curbside pickup offered at stores near you. Not only will seasonal fruits and vegetables taste better, but they can also be cheaper. There’s less overhead cost to transport crops locally, plus farmers are also often trying to sell all of their in-season stock before it rots. Fresh food will also last longer, especially if you buy locally. Food purchased at a farmers’ market may be slightly pricier than in-season stock from the grocery store, but it will last longer and may help you reduce the amount of food waste in your kitchen. In the corner of the price tag hanging on the grocery store shelf, you will find, usually in a smaller font, the price per pound, ounce or unit. Although one product may be cheaper, it will wind up costing you more in the long run if its unit price is higher, especially if it is an item that you use frequently. “Dollar-wise, it might be cheaper to by the eight ounce package of pre-sliced or pre-cubed or shredded cheese, but per unit (per ounce or per slice), it’s almost always far cheaper to buy the two pound block and slice, cube [or] shred it yourself,” said Raederle Clay, manager of Wind’s Four Corners Farms and a homesteader based in Pocatello, Idaho. The U.S. Environmental Protection Agency estimates that containers and packaging contribute over 23 percent of the material in U.S. landfills. Buying bulk will not only help you reduce packaging waste, but also help you save a little bit of cash — just make sure you are properly sealing and storing any items that you buy in bulk. 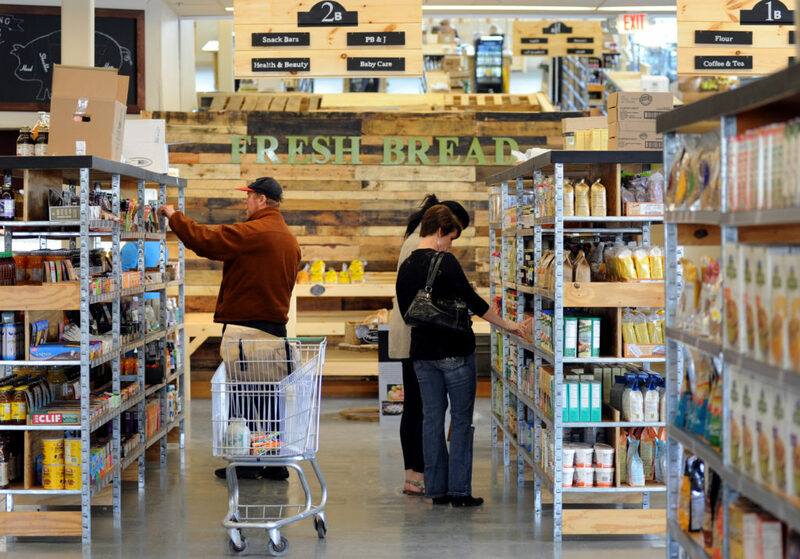 In terms of price, not all grocery stores are created equal. Check for discount grocery stores near you, and keep an eye out for “bent and dent” sections, which offer products with slightly damaged packaging or close to an expiration date for a discount. Groceries stores may also have a bin for “ugly” produce that is imperfect or blemished and is sold at a reduced price but is still perfectly good to eat. You do not have to limit yourself to one store, either. Plan your shopping trip around which stores offer the best deals on your favorite products. Psychologically, we value purchases more when they are made in cash. Studies show that carrying cash instead of defaulting to credit helps you better manage your budget, so carry cash at the grocery store. If you are getting ready to garden this season, plan around what you usually buy at the grocery store to save some money. Freshly grown food from your own garden will also keep longer — plus, it will greatly reduce your food miles and the environmental impact of your food it was grown right in your backyard. Freeze, can or ferment a portion of what you grow or anything you do not use right away from after harvesting.This preserves your bounty and helps you save money on vegetables year round. By making a few simple adjustments to your grocery shopping habits, you will be able to better manage your weekly finances — and, hopefully, plan delicious, seasonal meals for your family to eat.